They are not replaced simply due to age. Here in Phoenix could be sheet metal, or it could be flexible duct. HVAC units built in 1978 are not the same as they are today. Also, in most cases residential air duct systems are not properly designed in the first place. I frequently recommend total air duct replacement with a new unit (as well as the disconnect box on the exterior which is often overlooked). I don't think the HVAC guy is just trying to pad his pockets with more work. 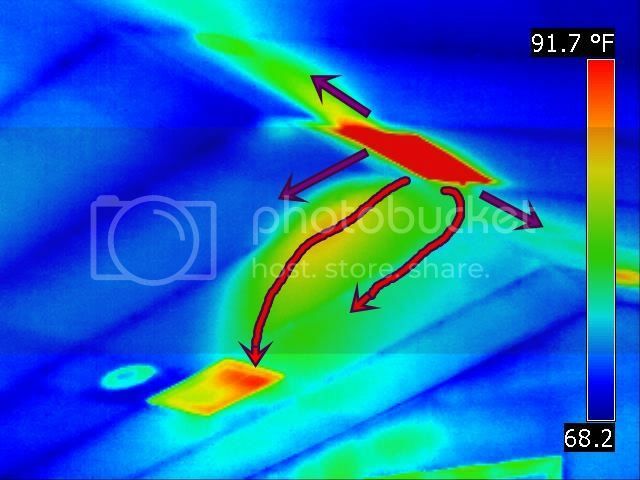 I can document several hundred home inspections where the HVAC duct system is not functioning properly due to improper design. I advise my clients that problems with discomfort is system design not equipment performance and to not waste their money on the equipment side. HVAC equipment can operate at full capacity and still not perform as intended. Air stratification due to improper duct design. When conditions like this exists in new construction, you can only expect cold feet and a hot head (and not because you're pissed off)! 61°F at the floor, 98°F in the second-floor bedrooms (one thermostat, two floors). If you're in CA, the original duct type does not matter. Complete duct replacement is often necessary to conform to Title 24 energy efficiency requirements as it pertains to replacement HVAC systems and components. Happening in your area too!!! A very SAD!! SAD!! SAD!! state of affairs at the residential level. Home Energy magazine has reported that 20-40% of the air moving through the fan (air handler) on residential forced air duct systems does not get to or return from the intended rooms!! If we were on top of this, every inspection department would require total heating/cooling load calculations for equipment sizing, room by room heating/cooling needs and a full duct design by certified professionals. Installers would be certified HVAC technicians and "tin bangers" would be required to seal ducts in a professional manner (high velocity duct sealer). We encounter a few old Coleman 1950's heating only systems that have 3-1/2 inch branch pipes that need to be removed and upgraded to 6 inch to get the required airflow for air conditioning. Unless the outer membrane has deteriorated its easy to seal old ducting to meet new Title 24 requirements. I would to sell everybody a new duct system as well but Ive brought many old systems below the 6% leakage thats required in systems installed in new homes. Do you have any more such photos? 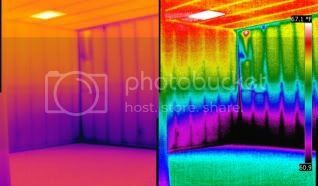 Reason I ask is that the HVAC training program at our local community college does not have a thermal imaging camera. Photos such as this will reinforce visually what I will be attempting to explain to them by lecture this semester. Yes Sir, I have a bunch! I am having computer issues at this time, formating, re-loading, backing up files (2 days to finish) but when all settles down so I can do a quick search I'll pull some up for you. Give me your course subject matter and I will make some scans if I don't have them on file. I sent you an e-mail forgot to include that ours is an HVAC/R course. So we cover the entire basics. Gas, oil, electric heat, heat pumps, air conditioning, domestic and commercial refrigeration, air flow distribution, heat loss/gain calculations.